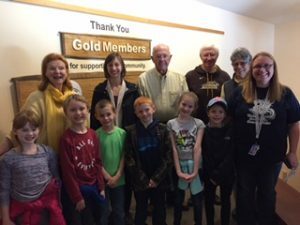 Community Foundation Board members joined students from Warren Area Elementary Center’s second grade classes on a recent visit to the Audubon, and were able to explore the Center’s beautifully maintained trails on guided nature walks. What better way to welcome spring than with a hike on the extensive grounds of the Audubon Community Nature Center? Especially on a warm sunny day! The Community Foundation is a proud supporter of the Audubon Community Nature Center’s environmental education programs in and for the Warren County School District. Experienced naturalists from the Audubon have seen all 2,000+ Warren County Elementary School students at least twice during the 2016-2017 school year, and the center also offers a number of seasonal events, including summer day camps for children of all ages. This year the Audubon is implementing new guidelines for their educational programs. Rather than simply presenting information to the students, the guides will ask questions in order to spark critical thinking and discussions about their environment. The hope of the Center is that by having great experiences outdoors and learning more about the natural world, the students will learn more about themselves as well. The Audubon Community Nature Center is located at 1600 Riverside Road, one-quarter mile east of Route 62 between Jamestown and Warren, Pennsylvania. Its three-story building is open daily, and houses the Blue Heron Gift Shop as well as a collection of live reptiles, amphibians, and fish. To learn more about the Audubon Community Nature Center call 569-2345 or visit auduboncnc.org.